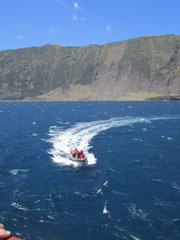 Information about the RMS St Helena, and reports of its cruises to Tristan da Cunha. 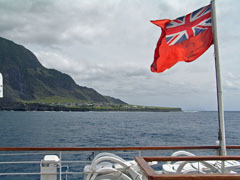 St Helena was formerly served by Union-Castle Line ships, some of which called on journeys between Southampton and Cape Town, from 1900. As air traffic grew the number of ships declined from the 1950s and Union-Castle liners were withdrawn in 1977. 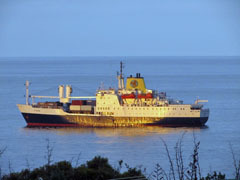 As St Helena lacked an airfield, the British government purchased a part passenger, part cargo ship Northland Prince (formerly used as a Vancouver-Alaska ferry) which was refitted and renamed as the first RMS St Helena. Originally built in 1963, this converted 3,150 ton ship had room to carry 76 passengers and supplies. The ship was used by the Royal Navy during the Falklands War as a minesweeper support ship. 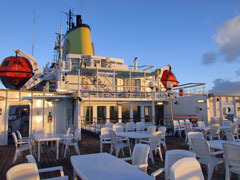 By the 1980s it was becoming apparent that the ship was too small for the island's needs, resulting in the new RMS St Helena, built in 1989. 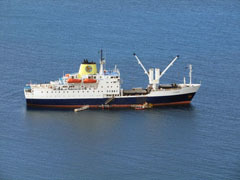 The new RMS St Helena was built by Hall, Russell & Company in Aberdeen, and entered service in 1990. 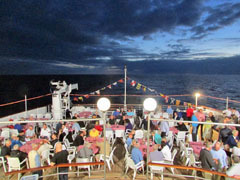 The RMS St Helena is a British registered Class 1 passenger/cargo ship, and operates with 56 officers and crew. 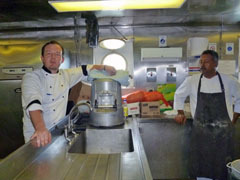 The RMS St Helena is equipped to carry a wide range of cargo, including liquids, to meet the needs of the population of St Helena and Ascension island. 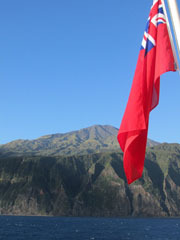 The ship's capacity was extended in 2012 by the addition of 24 extra cabin berths and a new gym. 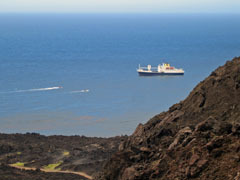 The 6767 tonne RMS St Helena is one of only two ocean-going Royal Mail Ships and one of only two remaining passenger-cargo liners. 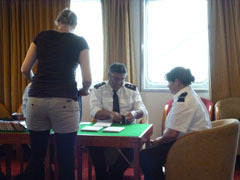 She has berths for 156 passengers plus 56 officers and crew. Associated facilities including a swimming pool, shop, and lounges. She also has well-equipped medical facilities and an on-board doctor. 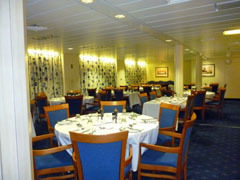 Facilities include a swimming pool, library, licensed lounges and a restaurant providing full board including a 6 course dinner, with every senior officer hosting a table. 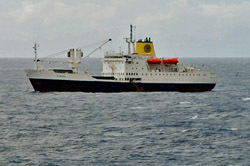 The original RMS St Helena made annual Tristan da Cunha voyages from 1985 until 1989. 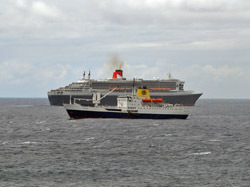 The present RMS took over from the old ship in 1990, continuing to make an annual scheduled trip to Tristan until 2004. The loss of the annual RMS trip was a blow to the Tristan economy, with the opportunity to import goods direct by ship from the UK and revenue from visitors. Since then the RMS St Helena visited Tristan in February 2006 with Governor Mike Clancy aboard to celebrate the 500th Anniversary of the island's discovery, in January 2011 when Governor Andrew Gurr visited Tristan and in November 2013 when Governor Mark Capes visited Tristan to commemorate the 50th anniversary of Tristan's Re-Settlement after the 1961 volcanic eruption. and below leaving the island. 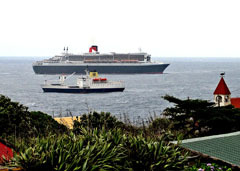 RMS Queen Mary 2 steaming by behind. 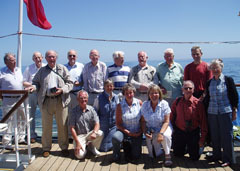 Right: Tristan Association Members who were passengers on the 2011 cruise. 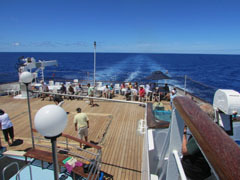 Two final photos from Sarah Cash's 2013 RMS cruise with the ship anchored at Tristan (left) and St Helena (right).